St. Louis City Recycles offers this list of commercial recyclers, which is not inclusive, to help local businesses, institutions and nonprofit organizations to recycle. We do not endorse any of these businesses or services. The variety and availability of these services may change at any time. Materials Accepted: office and printer grade paper, plastics (e.g. industrial, offices). Fee: free pickup, payment for paper collected. Included: bins for desks and exterior bins or Gaylords. If a large volume of paper is generated, they can supply balers and recycle more than printer’s waste and office paper. Note: They generally target offices, businesses, etc. with a minimum size of 200-300 people (or combined equivalent of multiple facilities). On-site shredding services and Certificate of Destruction are available. Materials Accepted: aluminum cans; brown, clear and green glass bottles and jars; plastic containers marked with a #1, 2, 3, 4, 5 or 7; steel food cans; unwanted mail; magazines; mixed office paper; newspaper; telephone books, cardboard. Fee: Contact Earth Circle Recycling for details. Will service schools for a fee, including one or two 90-gallon rollcarts. For special event collection, call for a quote (they use 90-gallon rollcarts). For one-time pickups of corrugated cardboard, call for a quote. Included: containers furnished depend on volume generated and storage capability. Materials Accepted: aluminum cans; batteries; scrap metal (e.g. aluminum, brass, copper, lead, steel); unwanted mail; magazines; newspaper; office paper; scrap paper; shredded paper; telephone books; cardboard. Fee: possible free pickup; possible payment for cardboard, metals and paper collected. Certificate of Destruction is available. Materials accepted: aluminum, glass, plastic and steel bottles/cans; cardboard; paper. Materials Accepted: aluminum cans, paper, telephone books, toner cartridges. Fee: picked up only when office supplies purchased from Pedro’s Planet are delivered. Included: 90-gallon rollcart (need 8-10 full carts before pickup). Certificate of Destruction may be available. Contact for details. 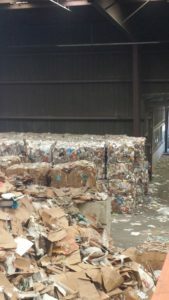 Materials Accepted: cardboard, paper & roll stock, newsprint, aluminum, steel bottles & cans, glass, & most plastics. 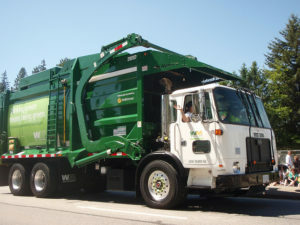 Fee Services: all types of Dumpsters, Roll-offs, or 95-gal Bin container services & collection. Onsite Document Shredding & certificate of destruction is available. Free* Services: office & printer grade paper, plastics and bulk cardboard (e.g. industrial, retail, offices) – *free pickup and/or payment for large volume producers. Included: under-desk cans, gaylord boxes, interior/exterior bins & dumpsters. For large volumes of paper, cardboard or plastic, they supply compactors, balers & baling wire ties. Materials Accepted: container glass (clear, amber, and green) and plate glass. Fee: no fees; contact Strategic Materials to discuss prices offered for materials. Included: assistance with collection, containers and transportation services. Note: Their Box Rescue program invites businesses that collect 100 or more of the same boxes on a recurring basis to sign up to have their boxes collected free-of-charge.